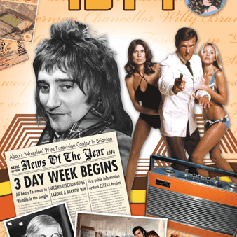 Birthday greeting Card with a History of the 1974 Year DVD. The personalities and the news stories that changed the World. This DVD features a fantastic retrospective look at a collection of wonderful original footage gathered from the vaults of some of Britain's leading news organisations. Take a trip back to 1974 and experience the lifestyle.